I have been an arts lover since a small child in Chile, falling in love with ballet, staging puppet shows for neighborhood children in my yard, and growing up in Boston reciting poetry on stage and organizing art events that go deeper than just “showcasing culture.” My first career was as a middle school math teacher, and education and curriculum development deeply inform the way I engage the arts and build community through it. I am currently Executive Director of a local nonprofit (new name forthcoming) I co-founded with Somerville artist Pampi which enables us to formalize the arts and community work we have collaborated on since meeting as undergrads in the late 90s. I love and honor planning, setting goals, working to meet those goals, spreadsheets, and creating a culture where people’s voices are elevated and nuanced discussion is encouraged. I would look forward to serving as a community culture liaison to civic leaders. Art is a vehicle and essential component of social justice, and with the myriad of issues affecting Boston and the surrounding communities, we need a strong process that will truly empower and uplift community members. Through active working relationships with local artists, educators and community organizers, I could help bridge policy so that it is grounded on the needs of Boston’s diverse communities. I want to share my experience, passion, and commitment towards our city through this timely and necessary undertaking. In the space below, please provide an overview of your current relationship with Boston’s arts and cultural sector (if any). My history with Boston’s arts and culture starts in my youth. I organized my first arts and culture event as a high schooler at Boston Latin, focusing on the expansive Latin American identities represented by the students, and continued through my college years at MIT with an expanded vision to connect to immigrant and diasporic experiences from around the world. Later, I worked in arts development at BalletRox, a local dance company with a youth focus. The organization Pampi and I co-founded works at the intersection of art, social justice and education with an aim to release creative potential and drive collective changemaking. This new venture is based on years of experience engaging and supporting community. An example of our work is a long-time series of over 15 curated and interactive art events that break down the artist-audience barriers and where we have micro-commissioned over 70 local artists of all disciplines to create original work around issues that are timely and relevant. Through this work, we have met and engaged with local leaders from across the arts and community organizing sectors, and I look forward to informing the Boston Creates process with these experiences and relationships. Pampi and I are also part of the founding committee of the new Mass Creative Workers, which is organizing artists from all creative sectors around the issue of a living wage and other needs so that cultural workers can remain in our local neighborhoods and maintain Boston’s reputation as a national cultural spot. We also co-authored the 70-page report for the May 2014 Greater Boston Cultural Convening organized by Dr. Barbara Lewis of the Trotter Institute. For this report we recorded and analyzed the two days of panels and discussion, distilled the themes that surfaced regarding the hopes and needs of Greater Boston’s arts and culture communities, and drafted recommendations as well as next steps. This guiding document and the experience of writing it would immensely inform the Boston Creates planning process because it comes from the voices of our local arts community. If you wish to share any sector-, discipline-, or issue-specific knowledge or specialization that you would like to contribute to Boston Creates, please describe in the space below. As an arts administrator, community organizer, and teacher, I place great value on being organized, thoughtful, inclusive, making things happen, and stepping up and back as needed. With an acknowledgement that all our work must always look at the big picture and all systems are inter-related, I bring experience in and an emphasis on intersectional models manifested through community-oriented programming. I have specific experience in event planning, group facilitation, grant writing, board development, and dance arts administration (concept development to performance). I also spent years in the retail industry where I learned the art of customer service, which is a much needed skill when engaging diverse audiences and individuals that enables relationship and coalition building. As I begin my third week in South America, currently in Rio de Janeiro, I wanted to share the lyrics to this regional anthem. I don’t remember a time when I did not know these words. Even while on the plane from the United States to Santiago de Chile, our first stop, this song was the most persistent of my thoughts. “Canción con todos” was written by Armando Tejada Gómez (lyrics) and César Isella (music), both Argentinean. Arguably the most famous version is the one by Mercedes Sosa, another Argentinean, who was a worldwide ambassador of the region’s New Song and folk music during her 50-year career. With a scream in your voice! NOTE: I will add more details over time. 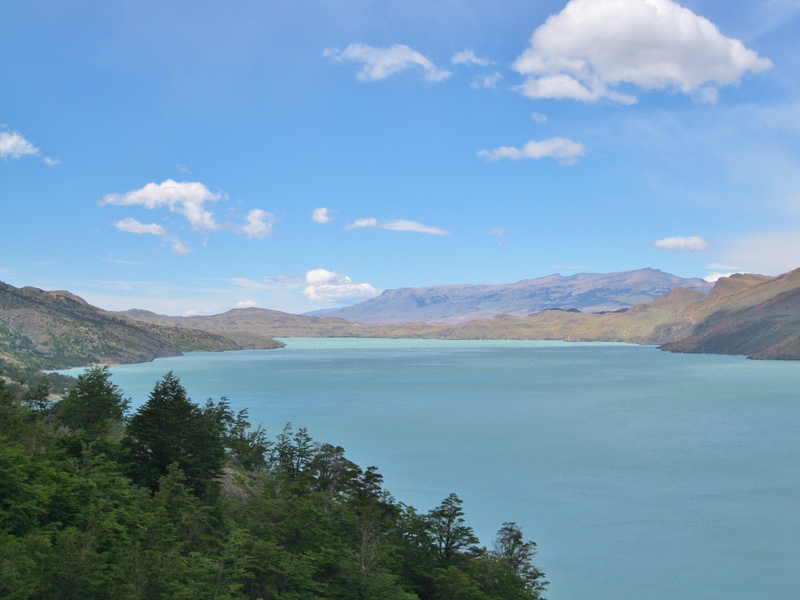 For now, I just wanted to get the logistical details of this post out there as the summer season begins in South America and people start to visit Patagonia in higher numbers. SCROLL TO THE END for a list of all the services, including bus lines, we used. PRONTO LO TRADUCIRE. Early this year, I took a trip of a lifetime with two dearly loved friends. We went on a three-week adventure that spanned three countries in South America’s southern cone: Chile, Argentina and Uruguay. 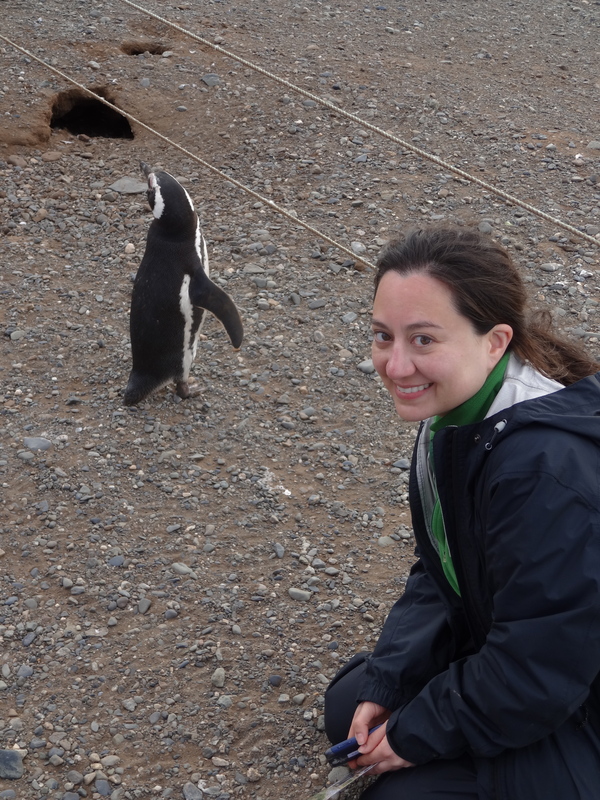 I was born in Chile and have a large extended family in Santiago and other cities up and down the country (note: Chile is so long and narrow that you’ll hear people talk just of north and south, or up and down). We spent a week in Santiago, a week in Patagonia (crossing between Chile and Argentina) and a week between Buenos Aires and Piriápolis, a beach town in Uruguay about one and a half hours east of Montevideo. It took me almost a year to plan the trip. Santiago was easy: stay with at my uncle’s, visit other family, and see as much as possible of the city the way locals do. Buenos Aires simply required finding adequate housing, which I did through www.airbnb.com (thank you J.Crew customer who told me about the service!). The rest consisted of walking and eating our way around the city with a map, the internet, and a tourist book. Piriápolis was trickier: We had to settle on the perfect beach destination that was far enough to feel like a getaway yet not too far to necessitate a long bus ride from the ferry station in Colonia where we landed after crossing Rio de la Plata from Buenos Aires or to the airport outside of Montevideo on the way back. It also had to be quiet enough for lazy and relaxed days in the sand, sun and water. Once we settled on the city, I again used airbnb to find a studio apartment within walking distance from the beach. See a map here of the cities and routes in the Argentina-Uruguay portion of this trip. 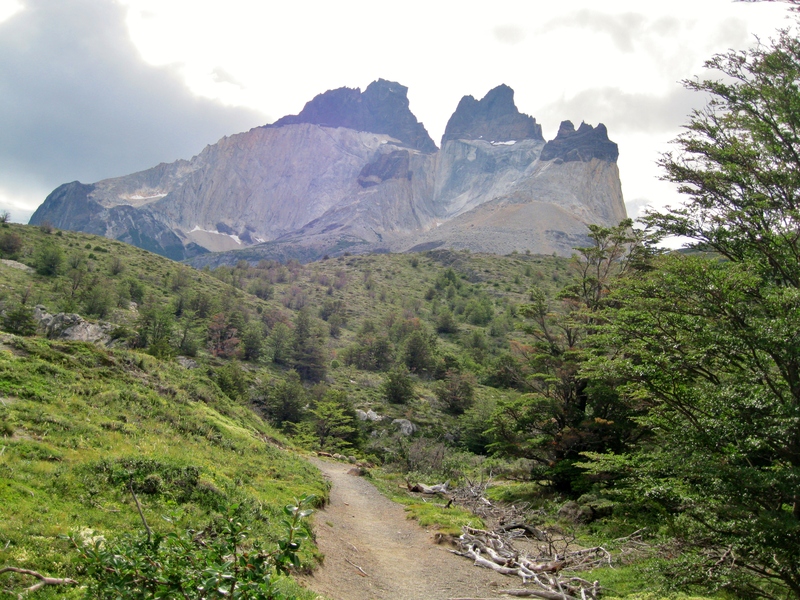 The part of the trip planning that made me want to run around and scream was Patagonia. 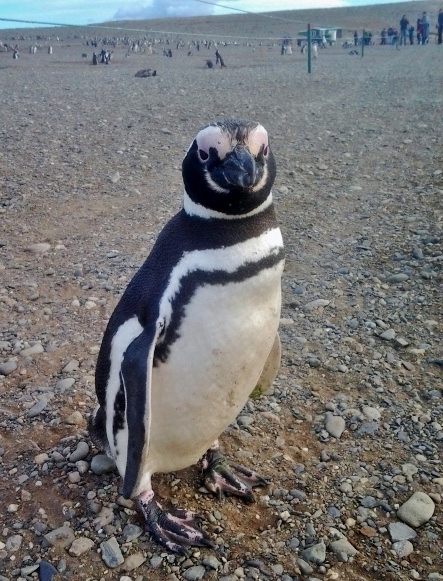 We visited Torres del Paine north of Puerto Natales in Chile, Perito Moreno glacier outside of Calafate in Argentina, and Isla Magdalena (a penguin colony and national park) in the Chilean Strait of Magellan. These three locations are consistently touted as the ones not to be missed. Click here for a map of the cities we visited and routes we took in Patagonia and which transportation companies we used for each leg. There is at once an abundance of information and a lack of detailed resources about Patagonia, both of which are overwhelmingly frustrating. I searched, emailed, and called endlessly to arrive at an itinerary that maximized our time and allowed us to include every chosen activity. 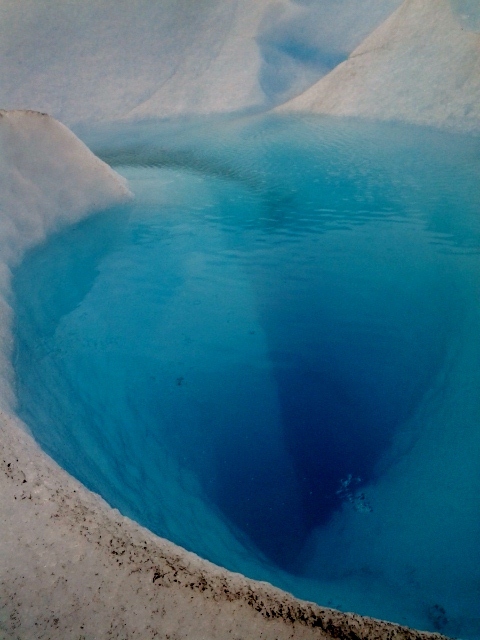 The following account details our nine days in Patagonia. 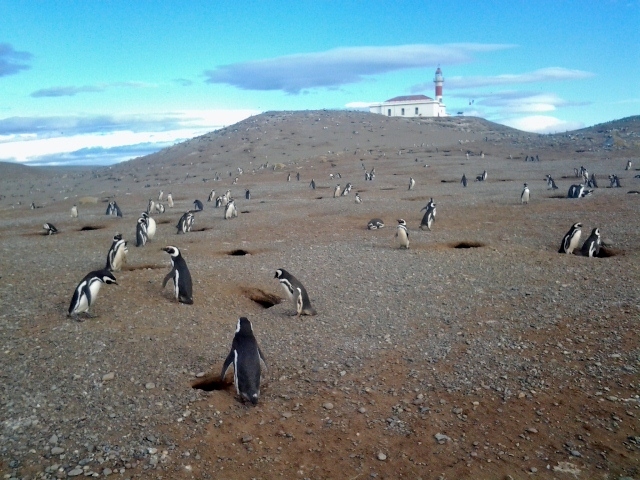 As summer approaches in the southern hemisphere and the number of travelers increases for a new high season, I hope it can help others planning a trip to this beautiful part of the world. A word of caution: Information changes quickly, so research carefully, and plan in advance to secure transportation and accommodations. Then, surrender to nature and soak up the experience! For each person per day, we packed: two energy bars and a baggie of trail mix, oatmeal with dried fruit for breakfast, and soups and pasta for dinner. We attempted instant eggs. and they were yuck! Many people made full meals on their tiny stoves. A couple even made pizza on their first night. Someone recommended buying a bag of fresh oranges for the first couple of days, which I would have done if we had spent more than 1.5 hrs in-between buses. 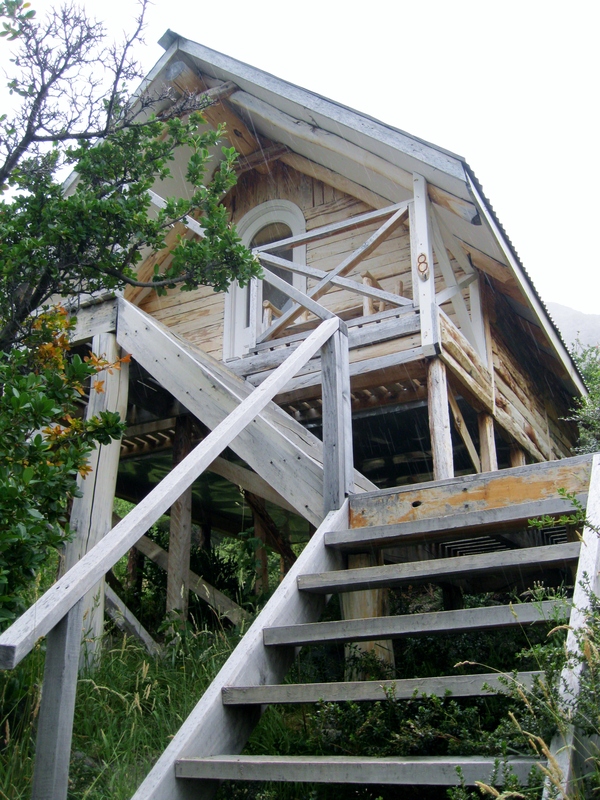 I strongly recommend adding US$30 dollars to the budget and buying dinner at least one night at one of the refugios (camp grounds). The nights we bought dinner (at Cuernos), the warm plate of pasta and cheap wine felt like a five-star luxury! Tent. Sleeping bag. Sleeping mat. Stove. Gas for stove (buy in Puerto Natales or at Torres stores, like the one in Refugio el Chileno). Plates & silverware (metal! our plastic ones stank). Extra rope & velcro strips. Camp repair kit, just in case. Backpack. Daypack (for hikes when you are able to leave the rest of the gear behind). Camera: photos & video. Walking stick if you want the support. Sunglasses. Hat (cold/sun). Gloves. Thermal under shirt and under pants. Enough underwear. Sports tops (to wear over thermal or on their own, short and long sleeve to mix it up depending on temperature). Water resistant/proof pants. Another pair of sports tights/light pants. Sports shorts maybe. Water resistant/proof jacket. Water resistant/proof hiking boots. Enough sports socks. Something to sleep in. Slippers for camp and the shower. Put everything in plastic bags to guard from the rain. The bags will come in handy for trash, laundry, etc. We packed our bags the night before and made certain all our gear was ready. This day was going to be extremely long. I was so nervous to have crammed so much into it that I had been having panic attacks since arriving in Santiago three days before. My friends assured me they were ready for adventure and we would have loads of fun, but still I panicked. 5 am: Plane from Santiago to Punta Arenas, LAN Chile. The flight was brief and the staff attentive. I actually love LAN Chile! 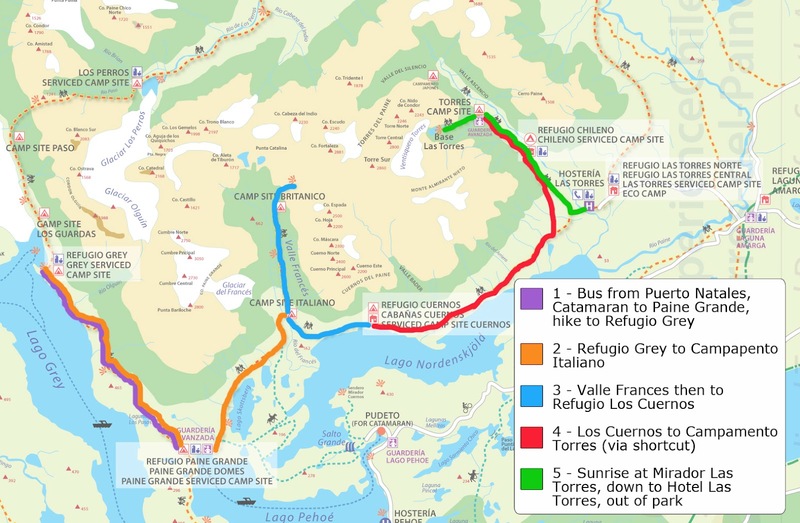 We likely ended up using almost every Patagonian bus line on this trip. In order to coordinate flights with final destinations, I looked up schedules for every company to find the best matches for our itinerary. After retrieving our luggage from the carousel, we waited for the bus by the curb outside the airport for about 45 minutes. When it arrived, the driver had our physical tickets. Bus Sur had sent me a PDF confirmation via email of the purchase. The bus dropped us off outside the Bus Sur office. The city of Puerto Natales is just now finishing a bus terminal out of which all companies will operate. At the time we visited, each bus line had its office somewhere around the small town; only two or three lines had already moved their operations to the bus terminal. There was about an hour and fifteen minute layover between buses. During that time, I had to run to the bus terminal from the Bus Sur office (about a 15-minute brisk walk) to buy tickets back to Puerto Natales from Calafate using Cootra bus lines (see Day 7). The only way to buy these tickets was in person at the counter. There was no way to buy them online, by phone or by email. 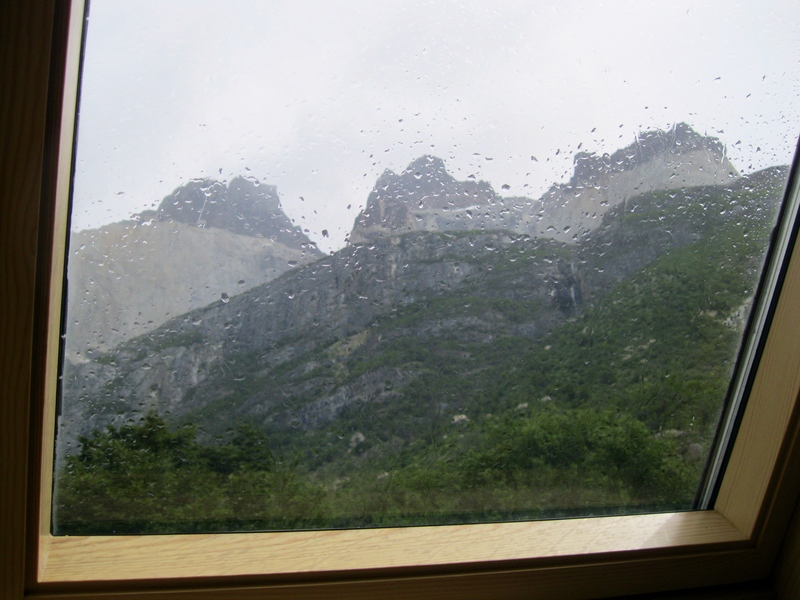 At 2:15 pm we left Puerto Natales and headed for Torres del Paine. The start to our nature adventure was palpable! 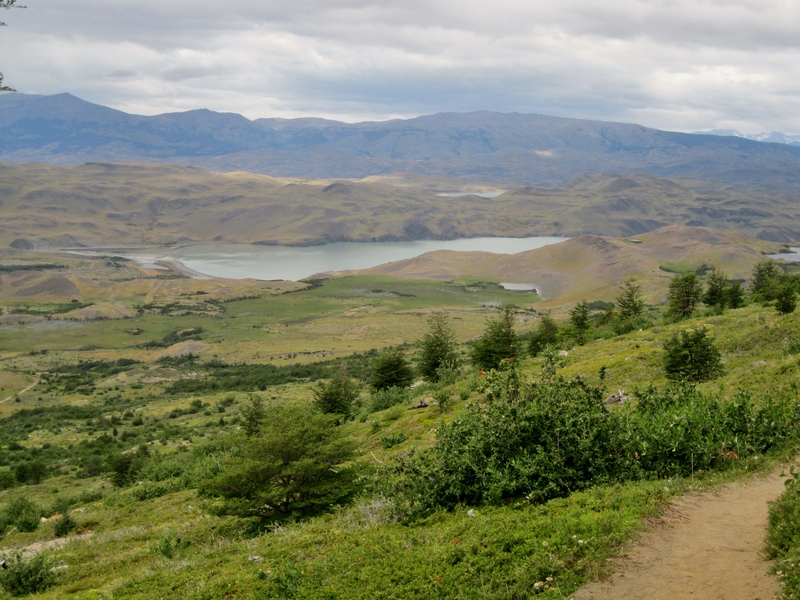 NOTE: In Torres del Paine, we hiked the W route: Five days was enough for us 🙂 We actually did the hike in four days – we did not have more time given our tight itinerary – and it ended up being doable for our skill level given we were not able/allowed to go to Valle Britanico (details below). 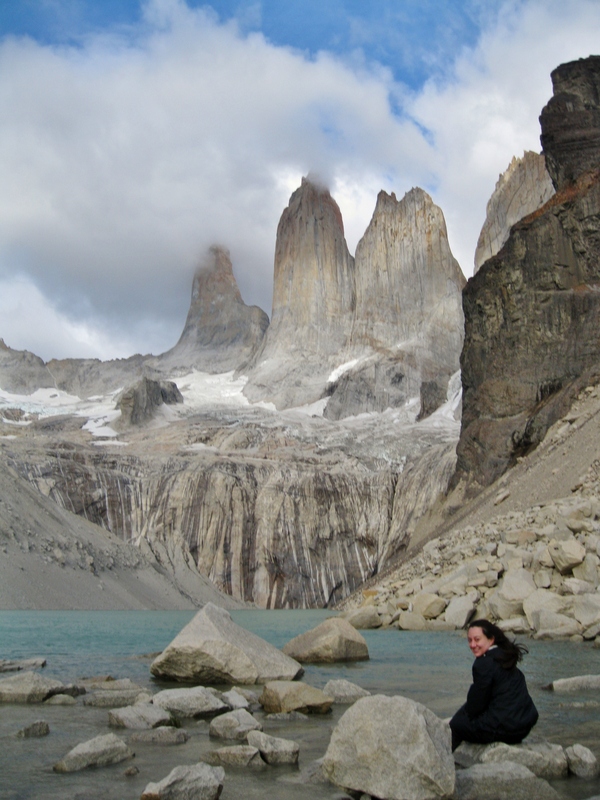 After many discussions with experienced Torres del Paine hikers, we chose to trek the W East to West; it fit out skill level and overall itinerary better. The map below shows a traditional West-to-East, five-day route. It can be done in four days with a little hustle. Five days allows for more relaxation and is easier on the muscles. More than five days makes room for much more leisure time and natural unpredictabilities. 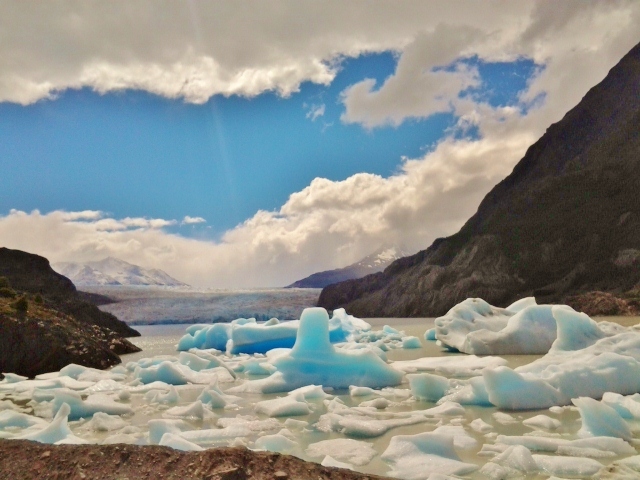 In Torres del Paine, one can experience all four seasons within one trip. We did! We saw sunshine, clouds, rain, (high) wind and even snow during our four days. For help from some wonderful people, visit the Facebook group https://www.facebook.com/groups/17344489636/. I received kind and patient wisdom from Alejandro He helped me map our entire hike with reasonable timings and detailed advice. Above map is from the very informative and organized blog by Steph & Ben on their trip to Torres del Paine. The ride was bumpy since most of it was on dirt roads. The views were wide and expansive, with hills and mountains rising here and there. As we approached the park, the Torres became visible. My seat companion first pointed them out. I could hardly believe that the iconic natural wonder I had been planning to see for almost a year was now just a few kilometers away. This transitory bus companion enveloped me in conversation about his adventure climbing one of the rocky Towers (there are three). I normally keep to myself and have difficulty engaging strangers. I need various encounters with someone before feeling comfortable saying more than casual niceties. Cristian talked to me without asking for my permission, and I was happy he did to help me embrace the unknown. His climb lasted 36 hours. He did not sleep a wink, even though he could have while harnessed. There is a special permit needed to climb the towers, and the task is “at your own risk” given the obvious risks. I love hiking, camping and the outdoors, but climbing the Towers is beyond the scope of my interests and not a goal I will ever set for myself. We arrived at the park at 4:30. The drop off location was dusty, and it looked like rain. The first few vans that took hikers to the starting point filled quickly so we opted to wait for the next one. After about 40 minutes, a van came for us and the remaining stragglers. The ride lasted about 15 minutes. The van dropped us off by Hotel de las Torres. Eager to begin the first leg of the hike, we quickly followed others to the start of the trail, made sure our gear was secure on our bodies, and set off with excited smiles and bouncy strides. The famous Torres! We had perfect weather to see the towers against a blue sky and among fleeting clouds. Night of terrible and hilarious wind. We had to rent a room (the last one left because everyone started renting). The wind broke my friends’ tent. We realized in the morning the beautiful view of the Cuernos we had from our room! 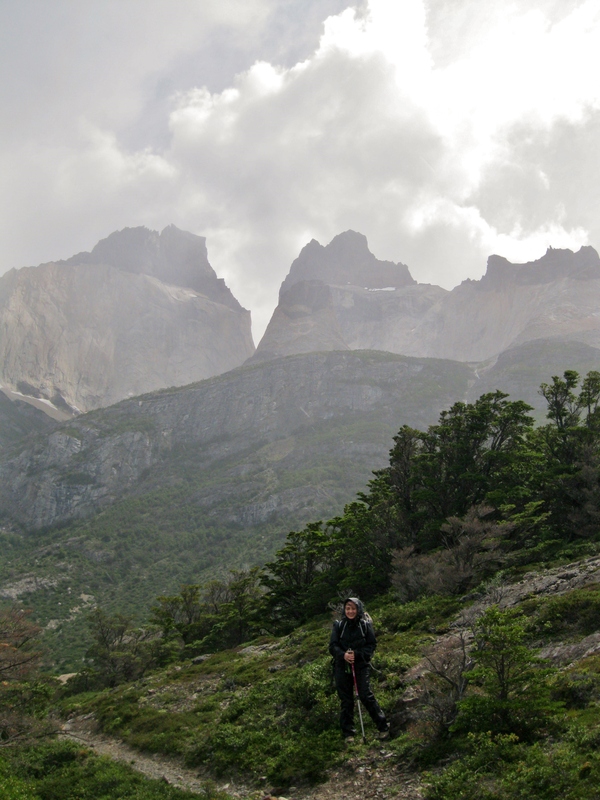 with Cuernos behind me in the relentless rain, heading to Paine Grande. Left park on the noon Catamaran. 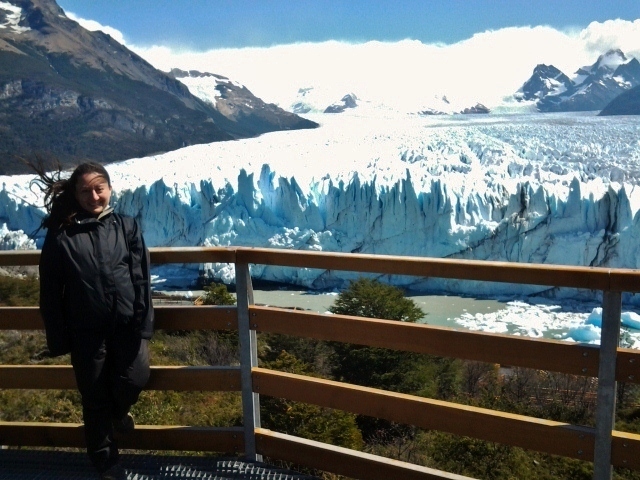 We bought the tickets at Paine Grande. See here for Catamaran schedules (scroll down). The Catamaran crosses Lake Pehoe. Hikers following the W must take the catamaran once: at the start if trekking West to East or at the end if East to West. The only bus I found that travels directly from Torres del Paine to Calafate is a tour bus by Always Glaciers/Chaltén Travel. We saved a day in travel by taking this route! Hopefully other companies start making this trip because many travelers are looking for this route. As of last year, this was the only option. Paid by completing a form with my payment information (credit card), scanning it, and emailing it back. Johanna helped me, and she was wonderful! 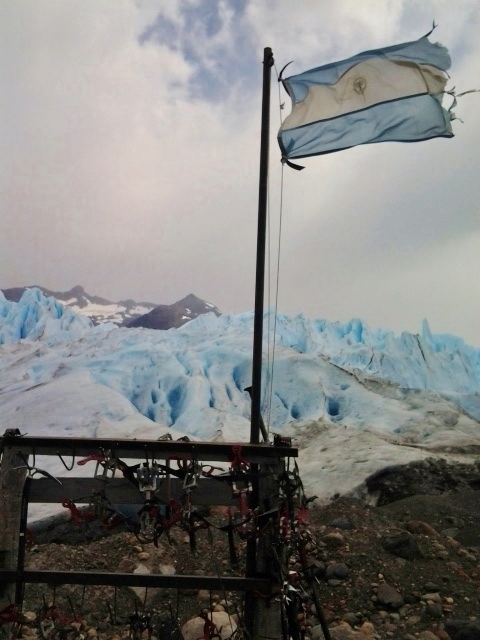 Minitrekking tour by Hielo y Aventura, the only company allowed to hike on the ice itself. The only way was to deposit money into their bank account in Chile, so my uncle made the deposit and I paid him when I arrived in Chile. I was able to pay by credit card over email. My own Obsessive Compulsive Disorder was diagnosed in 2005 at age 25. I had had symptoms since age 3. My entire schooling and teaching career were spent struggling with obsessions and compulsions that I knew were not logical but could not stop. I walk to help bring awareness about this disorder that most often goes undiagnosed for years, is terribly misunderstood, and can lead to debilitating lives. Visit my fundraising page to contribute to the walk: https://www.firstgiving.com/fundraiser/loretopansaldo/1million4OCD. My goal was to raise $50, which is the minimum goal. Since I found out about the walk only a week ago, I wanted to keep my goal small and focus on spreading the word. With the goal met, can you help me contribute even more? Please inform yourselves of this and other mental health issues. Help remove the stigma and instead focus on awareness and support. If you are my friend or spend a few hours with me, I will correct you on the pronunciation of my name. I just cannot stand hearing it butchered in speech more than a few times a day. When I worked in retail, I answered on average 5 times a day on its origin: where did it come from? why did I have a boy’s name? etc. but really as long as you hit the hard “t,” I am happy! Lore is then my nickname. It is not “lore” as in “folklore,” but more like “loreh” with the subtle roll. Next time I see you, you have better practiced!